buy into a partnership with Liz Rowe and Gord Hewitt, co-owners of Italian by Night. I’ve fantasized about opening my own place for years, but life always pulled me in other directions. By the time the girls had grown up and left home, I thought that I had out outlasted my infatuation with the food industry. I was too old. It would never happen. If you’ve been reading my blog for a while, you know that five years ago Liz and Gord hired me as a food consultant to create the menus and recipes for Italian by Night. You also know that four years ago they hired me to run the kitchen. After two hard, grueling, spectacular years, I resigned. I continued to write their seasonal menus, create their recipes and work with the chefs and cooks at Italian by Night, but I wanted to concentrate on my blog and see where that took me. I ended up being hired by Co-Op Atlantic. For the next eighteen months, I was their on-line contributor. I worked hard at the craft of food blogging, teaching myself to write and photograph food. I began designing menus for other local restaurants and giving cooking workshops. I loved the path I was on. Then I had another discussion with Liz and Gord. In short order, we formed a new partnership, secured a fabulous space and are currently designing the restaurant scheduled to open this fall. One of the biggest challenges the original location presented was its intended use. The line [the kitchen area where the cooks prepare your meal ] was designed to deliver for a fast paced deli. We made it work, but the thought of designing a kitchen specifically for Italian by Night is intoxicating. So here I am, middle-aged and beginning a bucket-list journey. I’ve dreamed of cooking in my own Italian restaurant forever safe in the knowledge that the time would never be right. Then wad’ya know, when I wasn’t looking I bump into Liz Rowe and Gord Hewitt and the opportunity of my lifetime happens. So beyond the restaurant design, I’m testing recipes daily before I write the new menu, which is partly why I haven’t been around as much. Today’s post was inspired by a little neighborhood restaurant that I used to eat at when I lived in Brooklyn. The owner would offer his guests a tiny jar of his wife’s Carote Marinate to munch on as an amuse-bouche. A simple generous offering that I’ve never forgotten. My recipe for this carrot antipsato is simple to make, ready to eat the next day, so you can do them in advance and if there’s any left-over they’ll keep in the fridge for a month. Once the water boils, drop the carrots in and simmer for one minute. Pour into an ice bath to stop the cooking action. When thoroughly chilled, pour carrots into a colander and drain thoroughly. 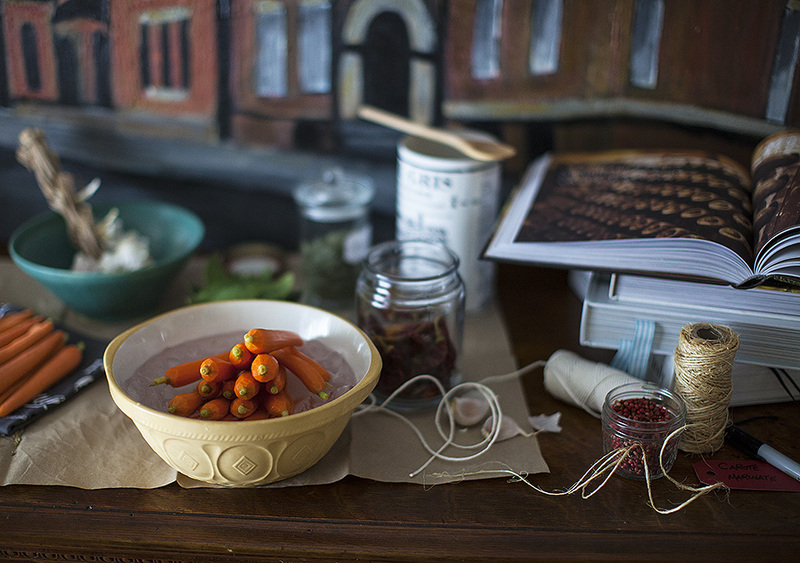 Pack carrots into your jar then pour the brine over them to cover. 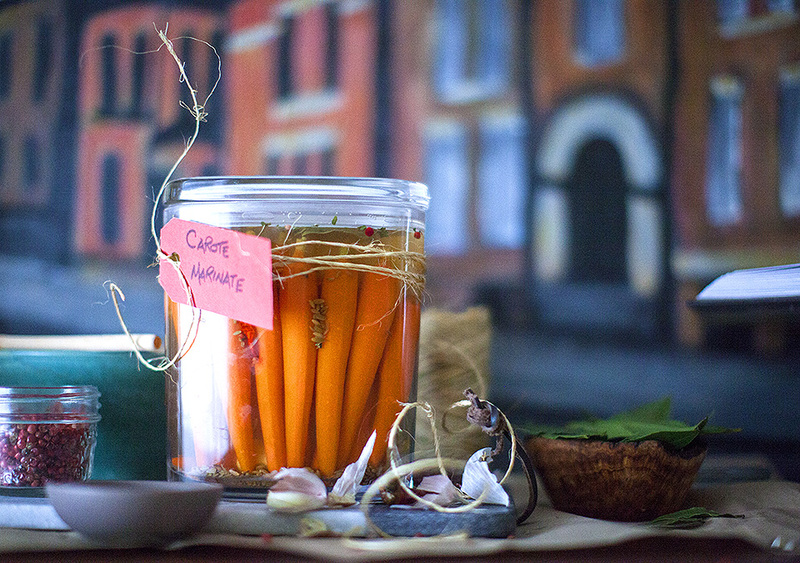 THE LOVE: Your Carrot Antipasto should be made at least one day prior to use. If there’s any leftover, they will keep for up to one month in the fridge. This entry was posted in appetizer, salads and vegetables and tagged antipasto, Carrot, Italian, Vegan, vegetarian by Michelle. Bookmark the permalink.